number-of-outlets int opt The first argument sets the number of outlets, in addition to the right outlet. If there is no argument, grab has 1 additional outlet. receive-name symbol opt If a symbol is present as a second argument, the message received in the inlet is sent to all receive objects named by the symbol, instead of being sent out the right outlet. In this case the rightmost outlet, which would normally send out the incoming message if no second argument were present, will not exist. bang Performs the same function as anything. 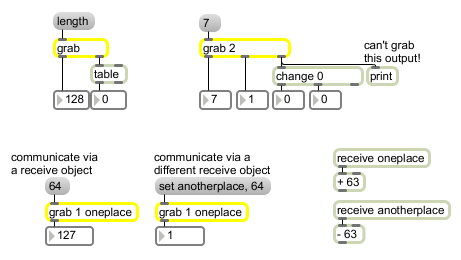 If a second argument has been typed into grab specifying the name of a receive object, then the word set, followed by a symbol, specifies the name of a (different) receive object via which grab can grab messages from remote objects. anything: Out right outlet: The right outlet should be connected only to the leftmost inlet of other objects. The message received in the inlet is sent out to the left inlet of all objects connected to the right outlet. Whatever goes out their outlets, however, is then intercepted by grab. Out other outlets: Whatever would normally be sent out the outlets of the objects connected to the right outlet, is sent out the grab object's outlets instead, in response to a message from grab. Whatever would be sent out the leftmost outlet of the other objects is sent out the leftmost outlet of grab, and so on. Note: Only the output that is sent out the outlets of other objects can be intercepted by grab. Other types of output, such as transmission of MIDI messages or printing in the Max window, cannot be intercepted by grab. Also, grab does not intercept the output of timing objects such as seq, metro, and clocker.